After four days of travelling, eight-hundred kilometres driving and some serious sightseeing, today we were planning an altogether less demanding sort of experience with a leisurely full day in the provincial town of Almagro. Breakfast at the Retiro del Maestre was simply wonderful and easily the best of the week, in fact, if we were compiling a list of the top five hotel breakfasts ever then this would certainly be in there. It was the usual thing in terms of content but it had clearly been lovingly prepared by the ladies of the house and the cook fussed around the breakfast room, making recommendations, making sure everyone was happy and brazenly fishing for compliments. And she deserved them all because this was truly an excellent breakfast. 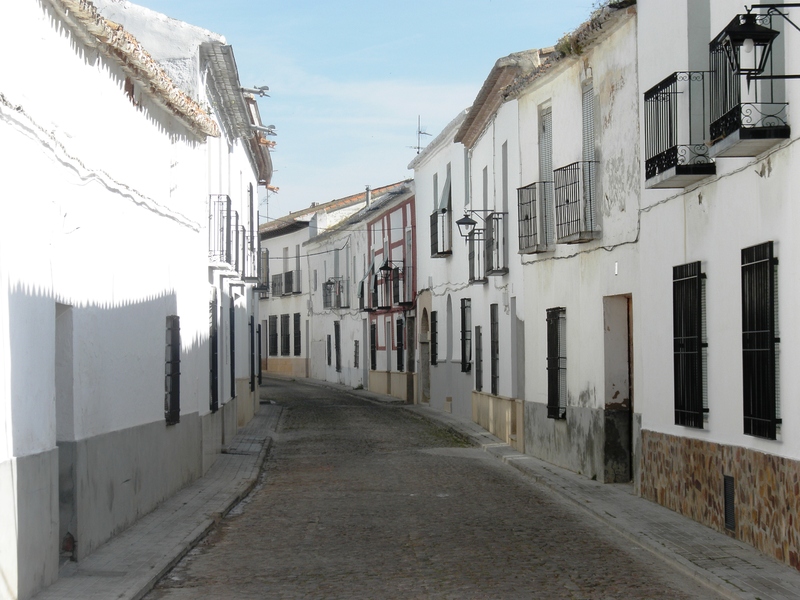 Eventually it was eclipsed by its neighbours, Ciudad Real and Bolaños de Calatrava and it became the quiet town that it is today on, not being unkind, a secondary, less important, tourist trail. 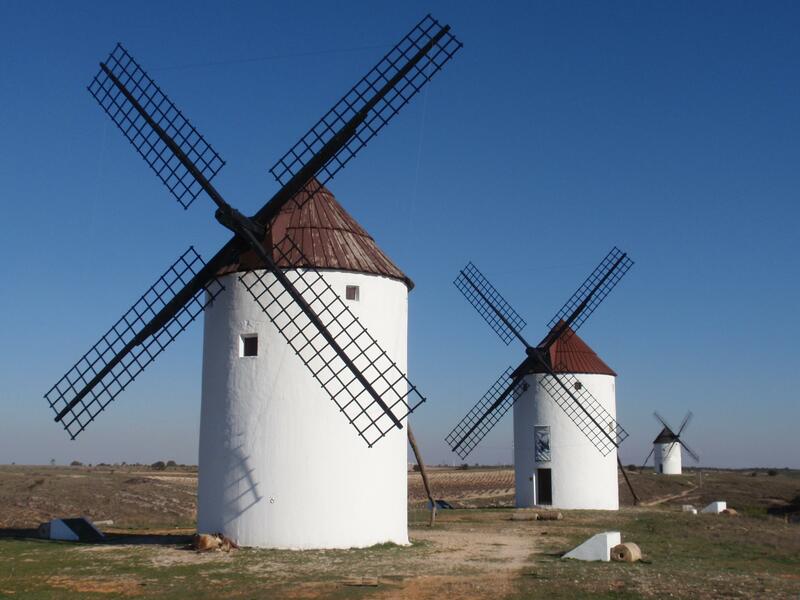 Talking of trails, as we stepped out into the street we were now inevitably on the ‘Ruta de Don Quixote’, which is the golden thread that binds the Castilian tourist industry together in a ribbon of towns, castles and windmills stretching from Cuenca to Toledo. Don Quixote is a novel written by the seventeenth century Spanish author Miguel de Cervantes Saavedra and is regarded as the most influential work of literature to emerge from the Spanish Golden Age. It is the story of a man who believes that he is a knight, and recounts his adventures as he rights wrongs, mistakes peasants for princesses, and “tilts at windmills,” mistakenly believing them to be evil giants. As one of the earliest works of modern western literature, it regularly appears high on lists of the greatest works of fiction ever published. In 2002 a panel of one hundred leading world authors declared Don Quixote to be the best work of fiction ever written, ahead even of works by Shakespeare, Tolstoy and Dostoyevsky. Cervantes has also been credited with shaping modern literary style, and Don Quixote has been acclaimed as “the first great novel of world literature”. Since publication in 1605 it is reputed to be the most widely read and translated book on the planet after the Bible. I tried to read it once or twice but found it a bit heavy going so gave up quite quickly but as we walked along I resolved to give it another go upon returning home. The historical centre of Almagro is conveniently located inside a circle of modern roads so this morning we circumnavigated it all as we walked through surprisingly wide and airy streets with the ubiquitous boxy white houses with little balconies and ornamental black iron grills over the windows where much of the town has been redeveloped to accommodate modern living demands. 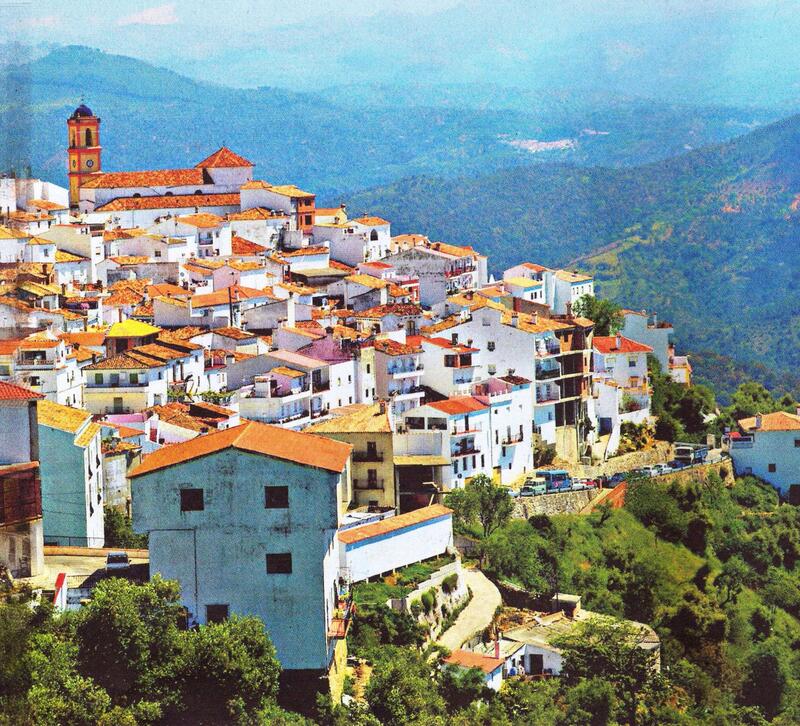 Along the route there were churches, a wide open park and a convent, now converted to a Parador hotel. We went inside to take a look but Parador room and menu prices are not really for us so we weren’t tempted to stay and instead made our way back to the Plaza Mayor. Although it was midday it was quiet in the Plaza as we selected a table for a refreshment break and we watched restaurant owners preparing for what they hoped would be a lunch time rush and then we looked around some of the traditional local craft and souvenir shops and then the not so traditional Mercadona for some essential alcohol supplies because our plan now was to return to the hotel and spend the afternoon relaxing in the sun on the roof terrace. As the sun moved from east to west in the sky we let the afternoon slip away with a bottle of local wine, a game or two of cards and a couple of chapters of our books but after a while some cloud was beginning to gatecrash the party sky and gradually it turned from azure blue to milky white as the sun was blotted out. This was our cue to leave the terrace and return to the town for the final piece of sightseeing. 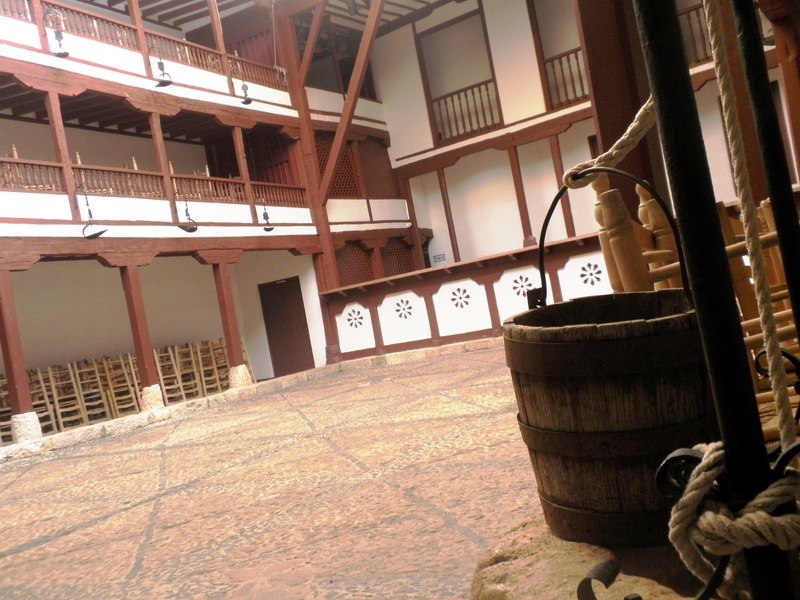 This was the Corral de Comedias, which is a sixteenth century theatre, similar to those that Shakespeare would have been familiar with in Elizabethan England, built in what was the courtyard of an Inn and which today is the only fully preserved example of a theatre of this type in the World. It is a working theatre still today and inside it is an immaculate example of a theatre of the golden age, built on three levels with galleries and private boxes running around all three sides of the still open courtyard. It was an unexpected little gem but it didn’t take long to walk around and listen to the audio commentary so after we had finished we stopped for a coffee and compiled a shopping list of souvenirs that we could confidently carry back in our hand luggage and agreed on some local pottery and some water colour postcards of the main sights of the town. There was time for a few more early evening minutes on the terrace but the weather was continuing to deteriorate and worryingly the hotel staff were beginning to prepare for bad weather by collecting up the cushions and winding in the sun shades that were no longer needed and this disappointed us but to be fair, given the pessimistic forecast before we arrived in Spain, we had been lucky all week so far with the weather. It had been a good day in Almagro and after dinner and before returning for the final time to the hotel we strolled one last time through the Plaza and had a final drink in a busy bar that was full of extended Spanish families all starting the weekend here in the square. It had been a quiet day but we had enjoyed the rest. Because there was quite a long way to go we planned for a very early start and it was still dark when we left just after five o’clock we surprised the car by piling in and starting it up at an obscenely early hour in the morning. 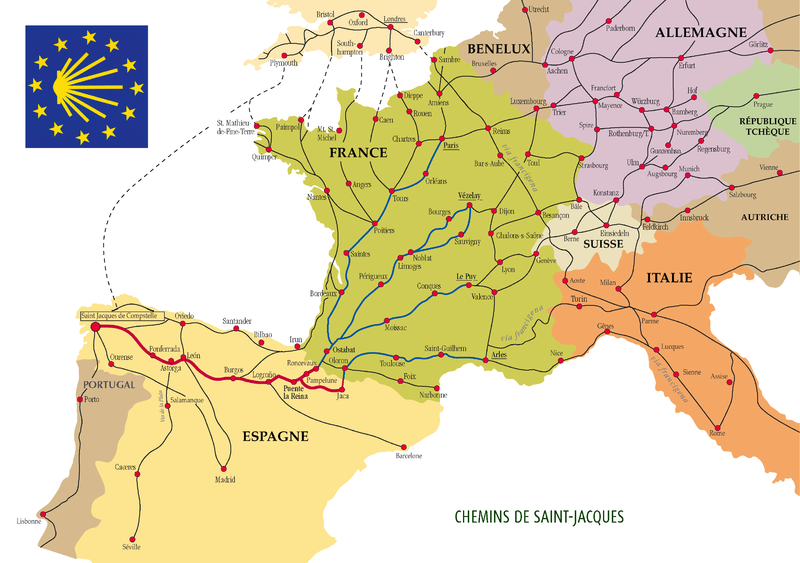 Tony had the rough guide to Europe map and had sorted the route and there was a very simple plan, we would take it in turns and drive non stop all the way, it would be tapas in Madrid at lunchtime, Bordeaux in France for evening meal, and a bottle or two of nice red wine, a night in Evreux in Normandy, and a visit to some friends who lived there, and then on to Dieppe in plenty of time for the ferry in just over forty-eight hours time. So simple it hardly needed a plan at all! Even though there was no motorway in 1986 the one hundred kilometre drive to the border was quite straight forward at this time in the morning but the lack of an offsite headlight did make things a little bit precarious at times. We drove inland for about half the way and then joined the coast road for the final section of the drive towards the border with Spain, which we reached more or less on schedule. That was the last time! 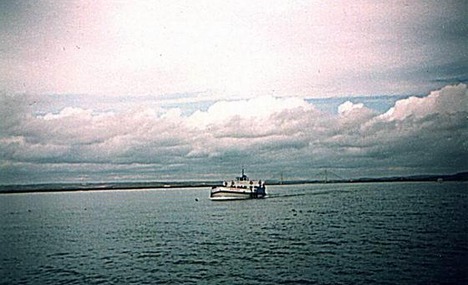 The border with Spain is the Guadiana River and these days a bridge takes the motorway straight across but for centuries before that the ferry link between Vila Real de Santo António in Portugal and Ayamonte in Spain was the only way to get across. 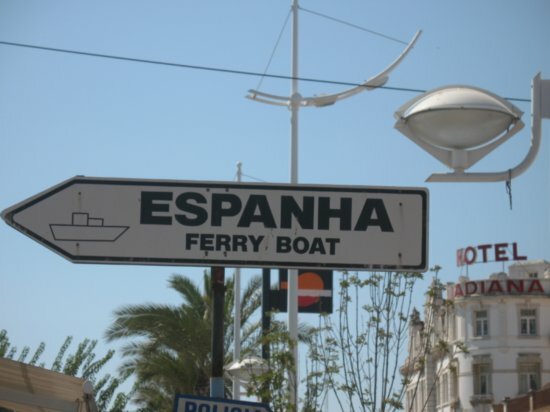 There was a slight delay waiting for the next available ferry but nothing too serious and as we took the twenty minute, two kilometre journey the sun started to come up ahead of us and we arrived in Spain in time for breakfast. This is when we came across our first problem. We needed fuel but none of the petrol stations that we passed accepted credit cards and it soon became obvious that this was quite normal in Spain. 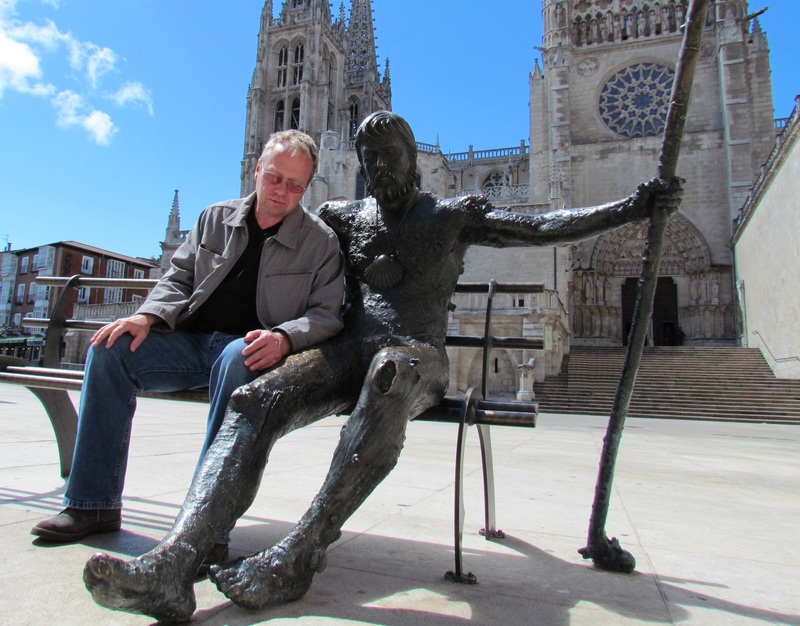 It was a problem because as we only planned to be in Spain for a short time we didn’t have many Pesetas between us. 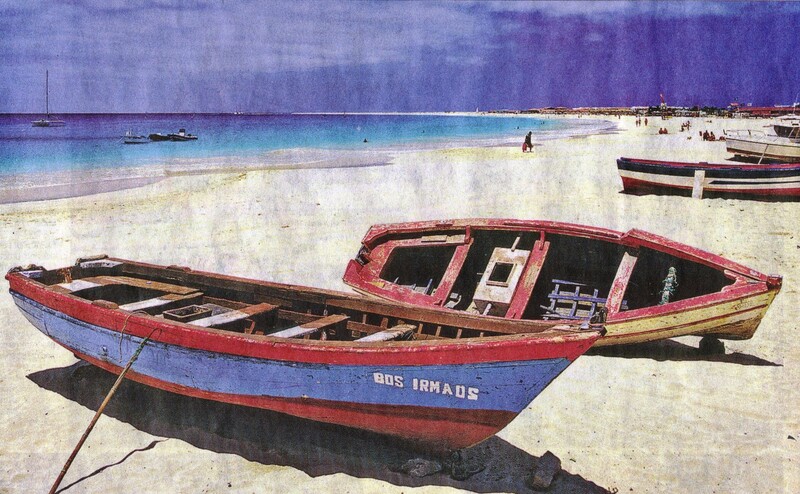 Eventually we had to resort to plan B and we pooled all of our Spanish currency for fuel purchases and that meant there was nothing left for food and we had to skip breakfast. And then there was the second problem because although the map indicated that we were driving on a motorway it wasn’t a motorway in the US Freeway sense of the term and this single carriage road went straight through the middle of every busy little town and village on the way and with every kilometre we travelled we fell slowly further behind schedule. Still, at least the weather was nice and we were in Andalusia, which is possibly the most typically Spanish of all of the regions of Spain and we drove through acres of orange groves and farms on the way to Seville a hundred and twenty kilometres from the border. By the time we arrived it was getting hot and we were quite surprised to find that the fourth largest city in Spain didn’t have a bypass and the road took us directly into the centre past the bull ring at the Plaza de Torres along some busy roads, past the railway station and on the road out the other side. 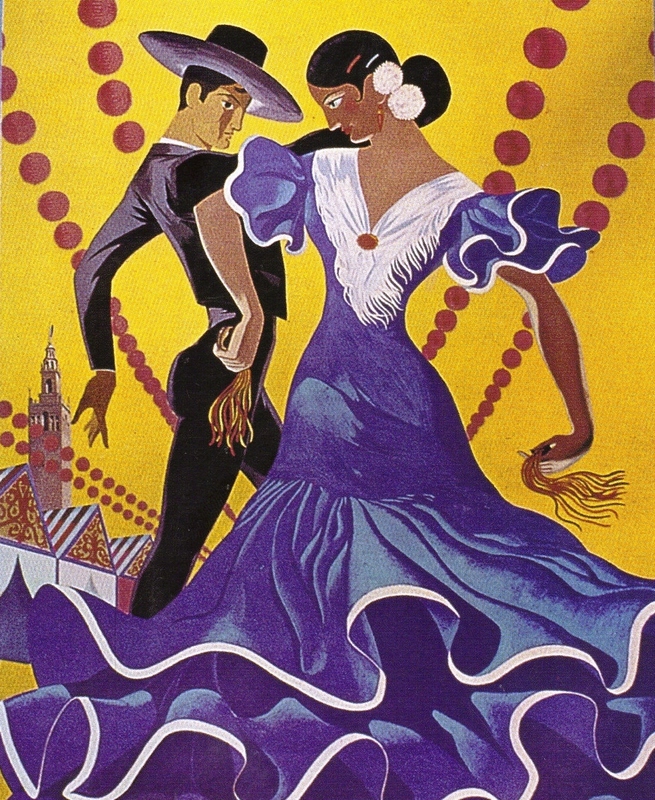 Seville did look absolutely splendid and everything that I imagined about Spain; bulls, flamenco, guitars, palm trees and beggars. At some traffic lights two scruffy boys without shirts and ribs like radiators started to wash the windscreen with a dirty rag and completely ignored our instruction to stop. Having completed the unnecessary task one of them put his hand through the window and demanded payment, ‘Cien’ he shouted, ‘Cien’. I was nervous because we had all sorts of things lying about on the dashboard within reach of thieving fingers and I quickly calculated that a hundred pesetas was actually quite reasonable so I gave him a coin. This didn’t satisfy the ungrateful little urchin and he demanded more from the others in the passenger seats while his pal stood in front of the car with arms outstretched on the bonnet. ‘Cien, Cien’ he kept shouting and this I thought was unreasonable and as there was practically no chance whatsoever of Tony parting with a hundred pesetas (he would rather swim with sharks or wrestle alligators) I decided to make a getaway from the hold-up, hit the accelerator pedal and drove on. The boy on the bonnet rolled theatrically to the side to feign injury and his pal chased us as far as he could until we were out of sight. We were pleased to be out of Seville and on our way to Córdoba another hundred and twenty kilometres away and on a road that followed the course of the Guadalquivir River and we passed through the city at about one o’clock and it was then that I had to concede that we would probably not make Madrid for tapas. Since leaving Alcantarilha we had been travelling relentlessly east and after Córdoba we had to continue for another hundred kilometres or so before the road finally started to turn north through the Desfiladero de Despeñaperros, which is a mountain pass that leads out of Andalucia and onto the plains of Castilla-La-Mancha, the Don Quixote country of windmills and castles and miles and miles of absolutely bugger all! According to the Spanish, that year (2009) Spain had had a longer and colder winter than usual, a fact that had been confirmed by the assessment of the man from the car hire firm and the weather over the previous two weeks had been changeable so it was with some nervousness that I opened the bedroom shutters to see what the day had in store. I needn’t have worried because the sky was a perfect blue, the birds were singing a sweet tune and the honey coloured stone of the church opposite was radiating deliciously warm mellow tones into the courtyard below and from this elevated position in the town I could see that the blue extended seductively in all directions. I instinctively knew that it was going to be a good day. Breakfast in the hotel was simple but substantial and after substantial portions of bread, ham and cheese we set off across the great plain of La Mancha in an easterly direction towards the city of Cuenca. La Mancha is an arid but fertile elevated plateau of central Spain, the largest in the Iberian Peninsula, stretching almost two hundred kilometres between the Montes de Toledo and the western spurs of the Cerros de Cuenca. On average it is six hundred metres above sea level and the climate is continental, but with extreme weather fluctuations. This is one of the most sparsely populated areas of Spain and agriculture is the primary economic activity, principally wheat, barley, oats and vines, but it is severely restricted by the harsh environmental conditions that exist on account of its lack of rainfall, the exposure to wind and sun and by the almost complete absence of trees. In fact years of neglect and lack of investment have created a serious land erosion problem on these dry plains. I am making it sound dull and unappealing and I must correct that immediately because this was absolutely not the case. Either side of the long straight road there were gently undulating fields with the most attractive colours that rolled rhythmically and desolately away in all directions. Many of the fields were being prepared for this year’s crops and others were lying fallow and this produced a stunning vista of subtle hues and variations of tone; champagne and parchment, butter-milk cream, dusty olive, lavender grey, pheasant copper gold and russet copper red that were almost autumnal all lying crushed under the burden of a vivid blue spring sky. One of the most interesting crops grown in La Mancha is the autumn crocus, the precious source of the world’s most expensive spice – Saffron, which is harvested from the dried stigma of the flower and is an essential ingredient of a Spanish paella and responsible for giving the dish its distinctive golden yellow appearance. As this was March we obviously didn’t see any autumn crocus on this visit. After a few kilometres there was a dusty track that left the road and led to the medieval castle of De Haro that was situated in a good position on the top of a hill and we drove to it but up close its condition was not what it seemed from a distance and it was not open to visitors so we retraced our steps and carried on. 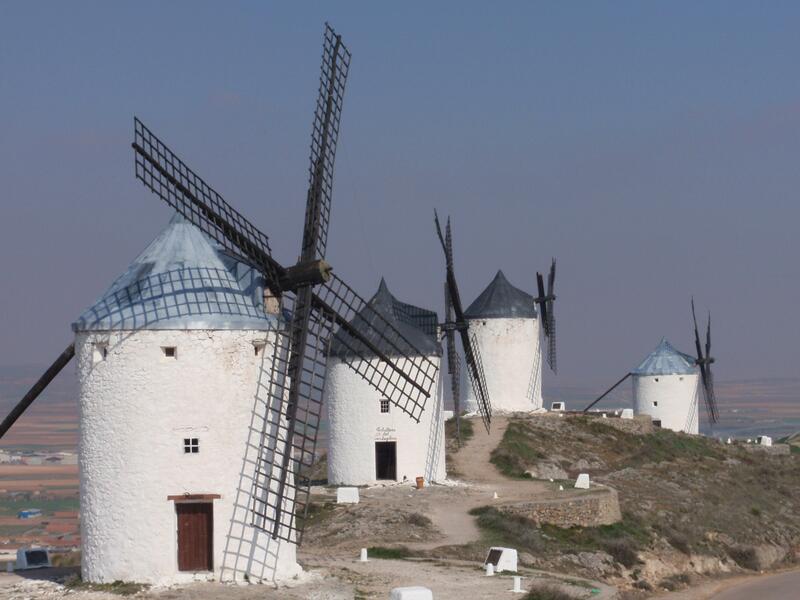 Now we were on the ‘Ruta de Don Quixote’ which is the golden thread that binds the Castilian tourist industry together in a ribbon of castles and windmills stretching all the way from Cuenca to Toledo. Don Quixote is a novel written by the seventeenth century Spanish author Miguel de Cervantes Saavedra and is regarded as the most influential work of literature to emerge from the Spanish Golden Age. It is the story of a man who believes that he is a knight, and recounts his adventures as he rights wrongs, mistakes peasants for princesses, and “tilts at windmills,” mistakenly believing them to be evil giants. As one of the earliest works of modern western literature, it regularly appears high on lists of the greatest works of fiction ever published. 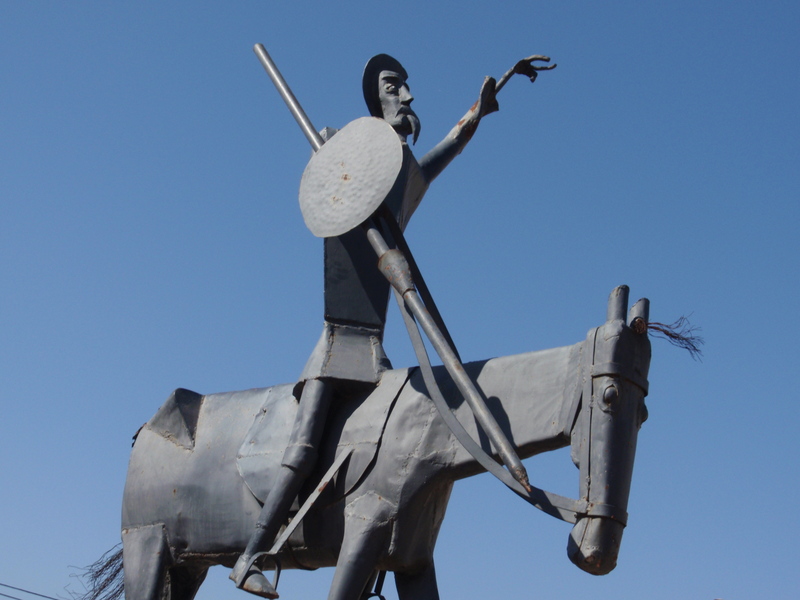 In 2002 a panel of one hundred leading world authors declared Don Quixote to be the best work of fiction ever written, ahead even of works by Shakespeare, Tolstoy and Dostoyevsky. 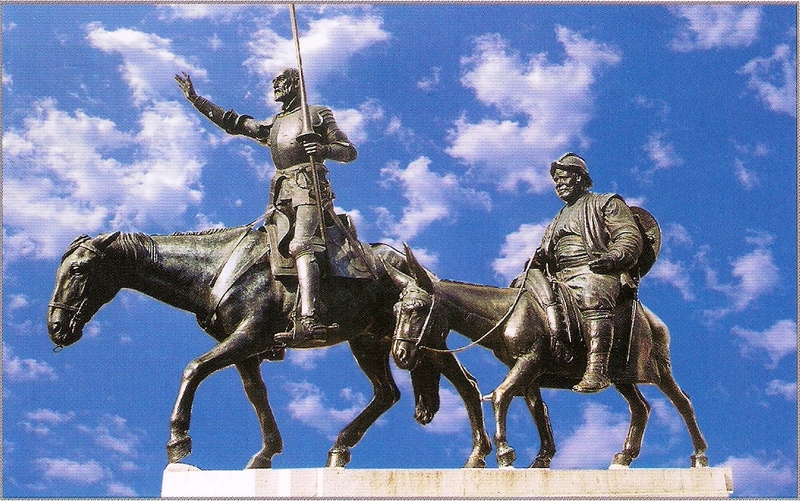 Cervantes has also been credited with shaping modern literary style, and Don Quixote has been acclaimed as “the first great novel of world literature”. Since publication in 1605 it is reputed to be the most widely read and translated book on the planet after the Bible. I tried to read it once but found it rather heavy going so gave up quite quickly but as we drove along I resolved to have another attempt upon returning home. After a couple of hours we reluctantly left the attractive little town of Chinchón with its beautiful square basking languidly in the afternoon sun and after threading our way through the narrow streets twice, by some miraculous stroke of good fortune, found ourselves on the right road and heading south to the town of Belmonte in the province of Cuenca where we were due to stay for the next three nights. After a short while the scenery began to change and it became much flatter but still with black olive trees and gnarled vines twisting away like Chubby Checker and endless fields of pretty pastel colours and at some point we passed out of the region of Madrid and into Castilla-La Mancha and we were in the land of Don Quixote and Sancho Panza but the first windmills that we saw soon after arriving were not the charming corn grinding mills of Cervantes but modern wind turbines instead. It was about a hundred kilometres to Belmonte, the road passed through several villages and it was busy, full of lorries and very slow. The navigator fell asleep and I became frustrated by the lack of progress and when an opportunity presented itself left the regional road and joined the motorway instead. This was much easier because for many Spaniards, driving on motorways is too expensive and the traffic density is gloriously low. This is in contrast to the main trunk roads running parallel to the motorways, which are jammed by drivers who are reluctant, or simply cannot afford, to pay the high motorway tolls. Toll motorways in Spain are a luxury for the wealthy and the high charges discourage most Spaniards, particularly truckers, from using them and add to the irritating congestion on other roads. Two junctions of the motorway cost €5.20 but it was worth every cent and we left it at Mota del Cuerva fifteen kilometres from Belmonte. So far we had done ever so well but with the navigator still drowsy and a little disorientated this was where we managed to get confused and lost for the first time and had to double back and make several detours before emerging on the right side of the town next to a hill with a row of whitewashed Castilian windmills. We stopped to see and take photographs and visited the little museum and admired the views over the flat, seemingly endless plains on either side of the elevated ridge above the town. Leaving the windmills behind we drove to Belmonte and arrived at about six o’clock in a curiously quiet and deserted little town. After a little bit of uncertainty we found the hotel Palacio Buenavista Hospedestra and checked in. It was one of those ‘have I made the right choice’ moments that you can sometimes get on arrival but it turned out to be a delightful and ours was a big room with traditional furniture, a red tiled floor and a good view over the hotel garden and the church next door. Very quickly the moment of doubt passed and I went out to find a shop for a bottle of screw top wine and some beer. This took some finding but eventually I came across a mini-market tucked down a side street and the purchases were made. It was a nice town and I have to say that I have a preference for hotels in smaller towns rather than staying in the big cities because on the whole they are friendlier and almost always cheaper! Later we walked out to find somewhere to eat but this was a sleepy little place and there wasn’t a great deal to do so we found a local bar and went inside for a drink. There were some local customers gathered around the bar and a family at an adjacent table. There was a sign on the wall that said “No está permitido fumar” but it was next to a cigarette machine and the rule obviously didn’t apply here because the air was thick and grey with swirling acrid smoke. Anti-smoking legislation became law in Spain on 1st January 2006 but for small bars and restaurants the legislation offers the owner the choice of going smoke free or not but if it doesn’t it means that customers under eighteen years old are allowed in that bar. This regulation was being flagrantly ignored as well. Compared to other European countries, where smoking in the workplace is banned altogether, the Spanish legislation is weak and confusing and it is estimated that smoking continues in 90% of all small Spanish bars. It was a very traditional sort of place where the customers had that curious Spanish habit of throwing their litter on the floor just underneath the bar where there was a collection of papers, cigarette ends, sunflower seed shells and other miscellaneous waste that made the place seem most untidy. Imagine doing that in the village pub in England and you’d get some disapproving looks and be asked to leave I’m sure! They weren’t that used to foreign visitors either and the little girl with the family kept edging closer towards us driven on by curiosity but always keeping a safe distance just in case we were visitors from another planet, and I suppose, to her, we might just as well have been. With eating options in the town seriously limited (i.e. non-existent) we returned to the hotel and enjoyed a simple but enjoyable meal in the restaurant together with a bottle of local wine and then after an early start and a long day went back to the room and a good night’s sleep. 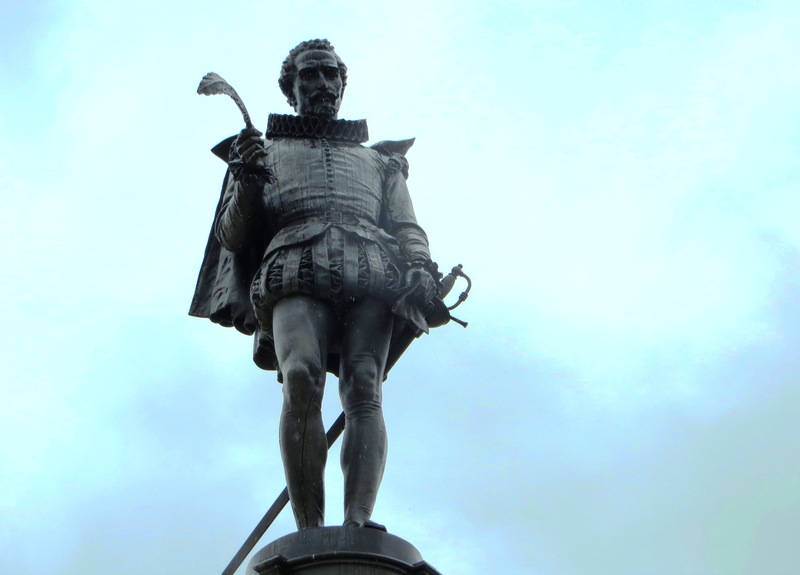 Cervantes, The World’s Greatest Novelist? 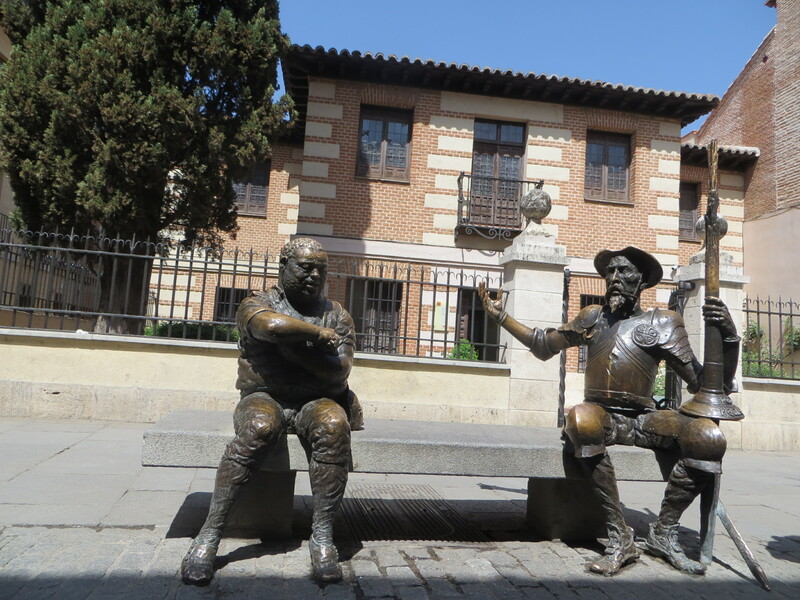 Miguel de Cervantes may have been born in the book-loving town of Alcalá de Henares close to Madrid but the creator of Don Quixote, that deluded hidalgo who tilted at windmills, did not have the opportunity to study in its hallowed University halls. His father, a blood-letting ‘surgeon’ who pulled teeth to make ends meet, could not afford to send him to school with the naughty young nobility of his day (although Cervantes would later depict those society figures in his pastoral novels). 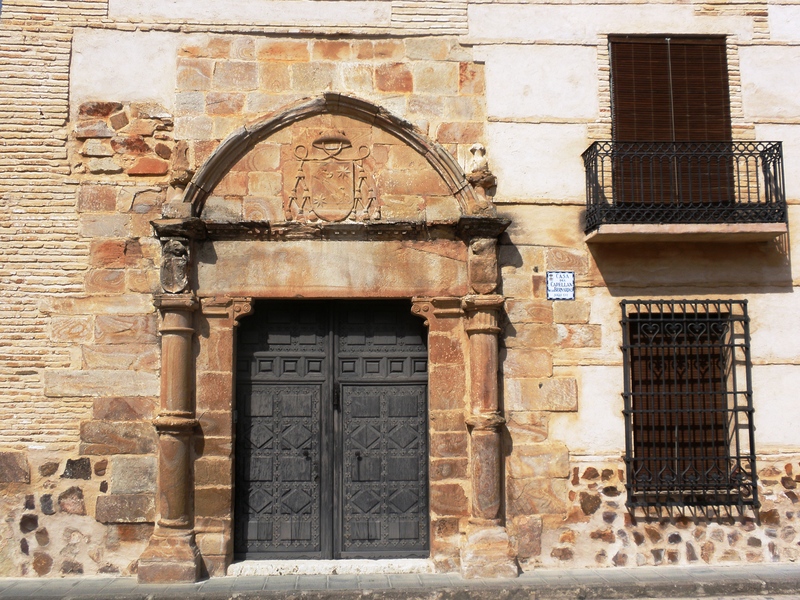 Cervantes spent his infancy in his grandfather’s home on the Calle Mayor, where he slept in a small room with his sisters, his mother, his grandmother, a cousin and an aunt. That two-storey house is now a charming museum that recreates the daily life of a well-off family of the 16th and 17th centuries, with some elements particular to Cervantes’ family, such as a tooth-extraction chair and spit plate like the ones his father would have used. But the polished restoration belies the economic hardship that haunted Cervantes after the family left Alcalá – and likely gave birth to memorable Quixote adventures. When Cervantes was four, his father left Alcalá de Henares to earn a better living, and the family wandered from town to town for 15 years. They travelled on dusty dirt roads on a mule-pulled cart presumably not much better than Quixote’s scrawny, yet beloved steed Rocinante, and often slept in “uncomfortable inns of ill repute,” as a museum plaque puts it, like the one in which sidekick Sancho Panza was cruelly tossed in a blanket. The museum on the Calle Mayor contains an extensive collection of Quixote editions, including one copy from 1605, the year the first part was first published to popular acclaim, and another illustrated by Salvador Dalí. 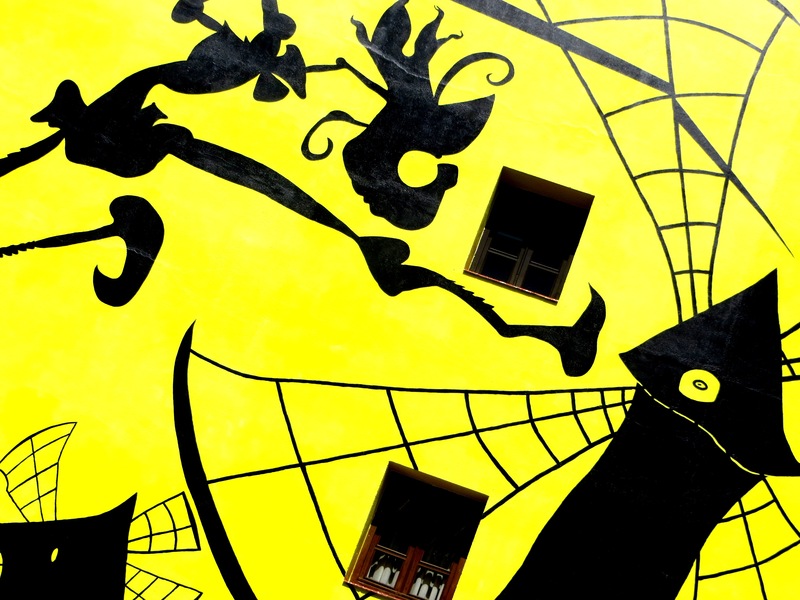 The often-slapstick tale, with its embedded narratives, societal critiques and comic characters, is considered the world’s first modern novel. 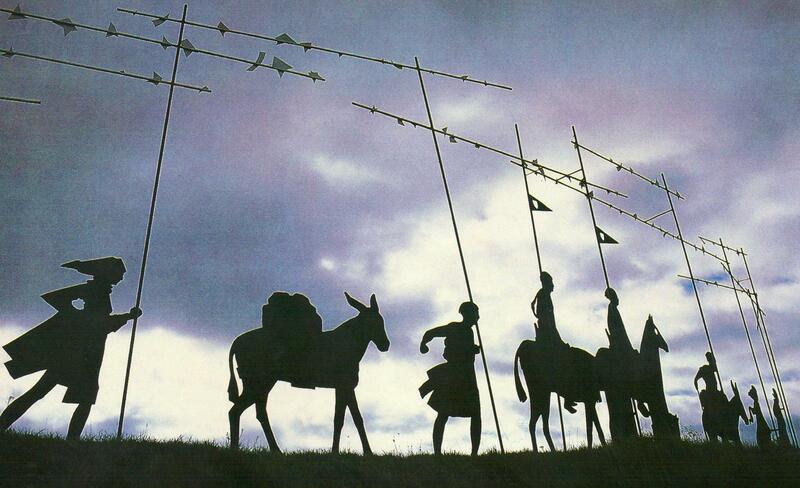 On returning home I did as I promised and bought a copy of ‘Don Quixote’. I found it on Amazon for the bargain price of £1.99, I ordered it together with a book on the history of Spain and it arrived three days later. I opened the package and then I remembered why I didn’t finish it at the last attempt. The book has nearly eight hundred pages and I estimate about four hundred and forty thousand words long and it has that tiny squashed up typeface that makes a book sometimes difficult to read. So, just in case I start it and abandon it again I have decided to carry out some research and do some preparation to try and understand exactly why this is such a good book and why I should enjoy reading it. 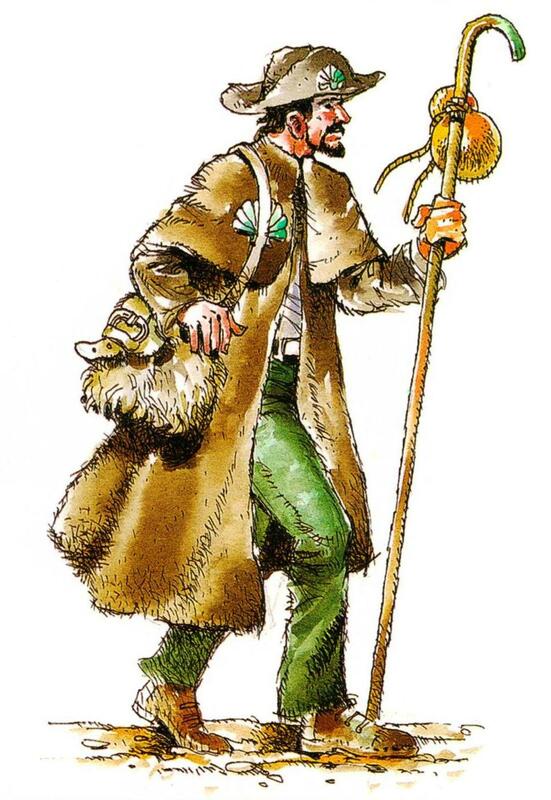 According to one reviewer Don Quixote is “so conspicuous and void of difficulty that children may handle him, youths may read him, men may understand him and old men may celebrate him”. I hope that I am at that “men may understand him” part of life whereas previously I was only at the “youths may read him” stage and that this might make a difference. 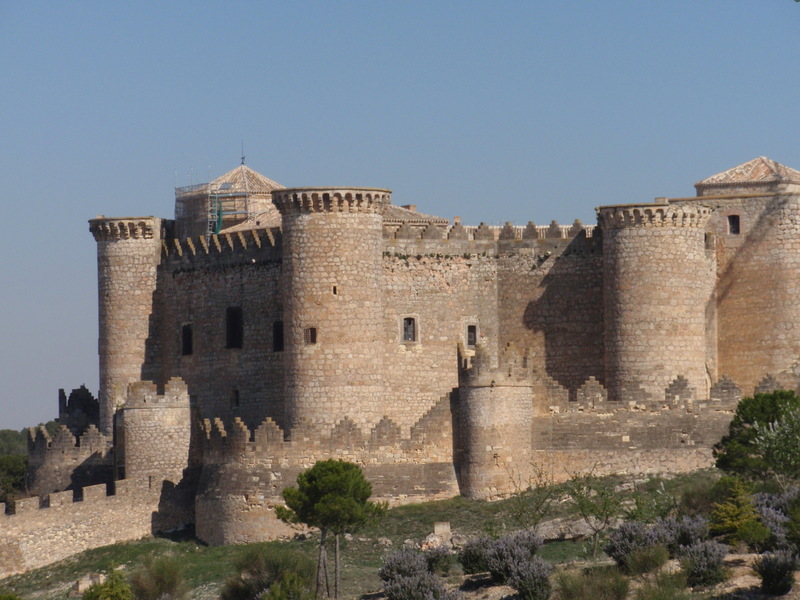 I think it will also help that I have now visited La Mancha and have some small understanding of the place and the people and this will explain the book when I begin to read it. I have read that first page a couple of times but have not yet felt completely ready to carry on so perhaps I will keep it for a holiday read? 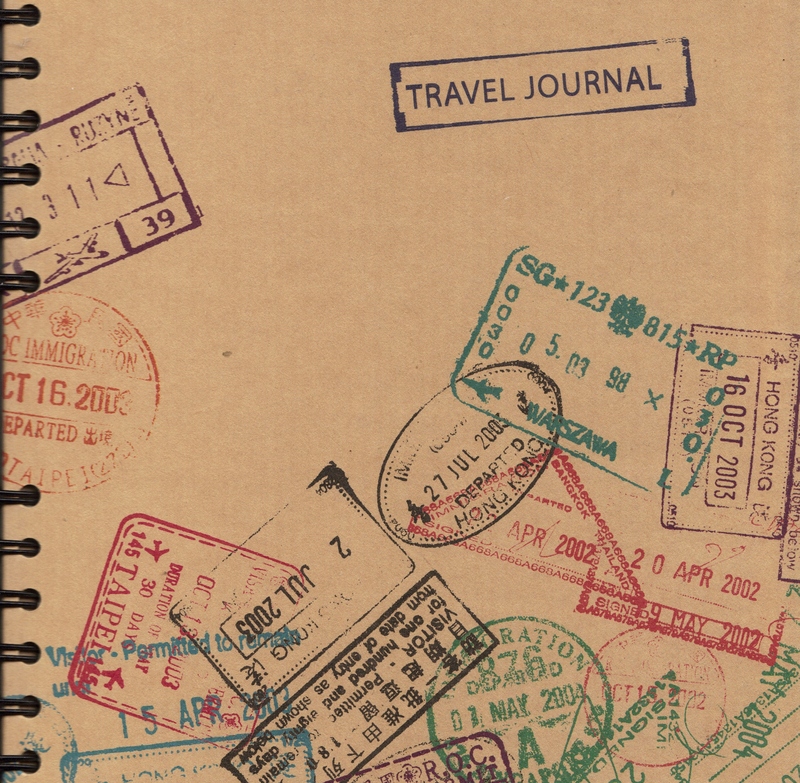 I am determined to do it soon and I will let you know how I get on but for now I have got to finish my Bill Bryson book, which isn’t quite such an important work in the history of World literature but has the advantage of being very easy to read.